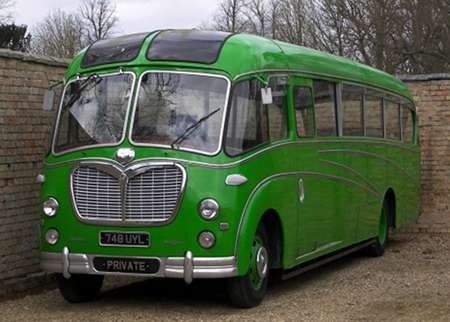 This is a Bedford SBG with a Duple C41F body that has a complicated history. It was first registered on 31 December 1955 as TUE 132, and, from 1 January 1956, went to Hills of Stockingford, near Nuneaton, Warwickshire. 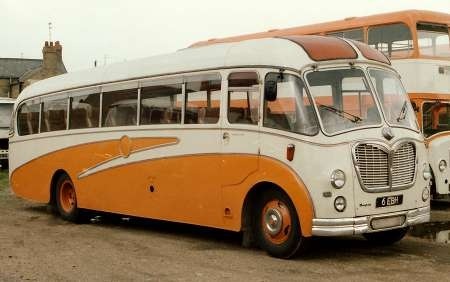 The vehicle, chassis number 41422, body number 1060/158, passed to Skills of Nottingham in October 1989. In July 1998 Skills swapped its registration, chassis and body numbers with another Duple bodied SBG registered 6 EBH, chassis number 62553 and body number 1090/150. The purpose of this exercise is perplexing. The former 6 EBH went to John Burton Coaches of Alfreton in June 1999 until scrapped early in 2001. It is unclear how this surviving SB acquired the number 748 UYL. Though originally an SBG (gasoline) example, it now possesses a diesel engine, type uncertain. It currently resides in the car park of a garden centre, “The Walled Garden at Elton Hall”, at the village of Elton in Huntingdonshire. Before this it spent its time parked on the side of the main road through the village, as seen in this picture. Internally, the body is completely gutted, though it does not appear that any active restoration is in progress. I acknowledge the flickr site of John Wakefield as the source of this information. It acquired the ‘age related’ (748 UYL) when the previous owner transferred 6 EBH off onto his car. The current owner now looks to have changed his plans, its back on sale on the http://www.carandclassic.co.uk for £24000 plus VAT Previous owner restored chassis & body exterior leaving the interior to be completed, the seats & interior were sold with coach so presumably in store somewhere. Thanks for filling in the last bits of the jigsaw, John. Having seen this Bedford languishing in Elton for some time, I decided to photograph it and send it to OBP to glean some information about it. I then discovered that your flikr site had already identified its unusual history. Out of interest, if Skill’s swapped the registration, body number, and chassis number, between the two coaches, how does it come to be known that an exchange of identity took place? Were there obvious differences between the two vehicles? BLOTW gives the original 6 EBH as SB3 – was there any difference between the SBG and SB3 models or was it simply an updating of the code? 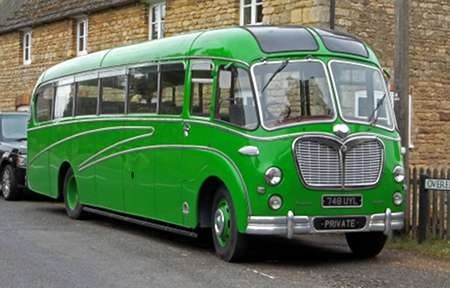 The SBG (petrol)/SBO (Perkins R6 diesel)) designation continued after the lengthening of the wheelbase in 1955 to 18ft.6in., only becoming SB3 (petrol)/SB1 (Bedford 300 diesel)/SB8 (Leyland 0350 diesel) from 1957. In terms of Duple Super Vegas this occurred part way through the 1074-series of body numbers. The SB5 (Bedford 330 diesel) replaced the SB1 from late 1961, the change taking place during the production of the 1045-series Super Vega. How legal was this swapping of plates and identity? In this day and age it would be called ‘a ringer’. Here is photo of the ‘real’ 6 EBH when with Canham of Whittlesey. Roger, any further news on 748 UYL, is it still at the garden centre at Elton? if so maybe you could take another pic. Yes, John, it’s still at the garden centre called The Walled Garden at Elton Hall. It hasn’t moved since my original posting in January, and no work on the interior seems to have been undertaken either. This picture was taken on 16 March. When I last looked at this Bedford very recently, no work had been done on its gutted interior. It has now gone from the Elton Hall car park. 748 UYL was at East Coast Upholstery in Pickering on 16/7/17 when I took these photos, it was still there 13/8/17, still no seats, but must be having some fitted! 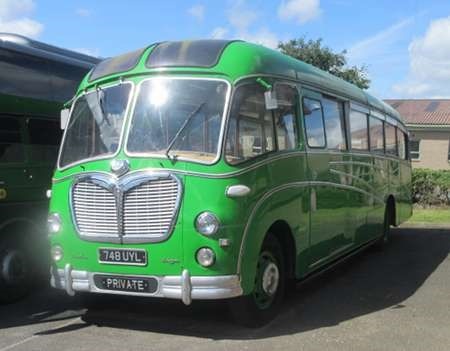 "Known vehicle: XBH 777 Bedford SBG 46298 1/56 , 5/63, 3/66 Duple C41F (1060/352). 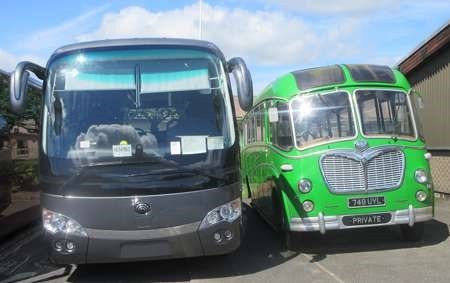 New to Jeffways Coaches, High Wycombe, Jeffways and Pilot Coaches, High Wycombe 5/60." I was very kindly helped to do some research by several people, but a computer problem a year or two ago led to me losing their contact details and some of the explanations that they gave me! Can someone please de-code the bit in quotes for me?? and tell me if this photo would be a good approximation of the vehicle referred to. SBG Chassis type-SB Model G= Gasoline (i.e. Petrol engined). 46298 = Bedford Chassis number. C41F = 41 seater coach with a front entrance. 1060/352 = Duple body number. The answer to the last part of Joanna’s question is yes. Re 748 UYL (TUE 132) I have recently spoken to Neil at Eastgate Coach Trimmers, Pickering (not East Coast Upholstery) he has now recovered the seats & has now to trim out the interior. I asked him who the owner was & he was reluctant to tell me, just that it was a private owner in Essex & he would pass on my contact details. Have heard no more. Apparently 748 UYL (TUE 132) is bound for New Zealand. It went from Pickering in early Feb into temp storage in the Peterborough area. The new owner (Brent Cooper) a New Zealand resident. It is not known what use Mr Cooper will make of the SB, possibly part of a vehicle collection. Current NZ Construction & Use regulations do not permit wooded bodied buses & coaches. Readers may remember the saga of OB JAB 867 that went to NZ in 2006 but had to be returned to UK after owner could not get it certified for PSV use. I dont suppose the number plate issue will be relevant to owner now, as it will have to have a new registration when it gets there.